The Writer's Challenge: I Finished The First Draft! Now What? I am happy to report that yesterday I finished the first draft of my 50,ooo word category romance "Snowed in With a Millionaire". I went to a NaNoWriMo write-in with 43k words and found myself writing for 6 hours straight until I had pounded out those last 7K and wrote the words "The End". Since I started writing November 1st, that means it took me 3 weeks. I've never written so fast in my entire life. It was so much fun! Now that the first draft if complete, the work is far from over. Now the real work begins - I need to get the manuscript in good enough condition to be able to show my writer friends. They'll help me figure out what's unclear so I can get some nice revisions going. Today I'll share with you some advice about first drafts from Karen Miller. 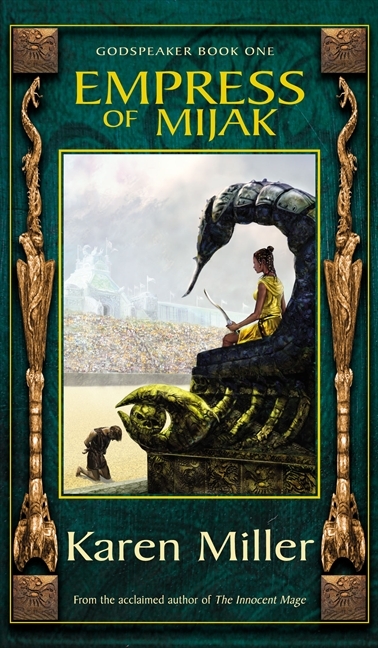 Karen Miller is the author of the bestselling fantasy duology Kingmaker, Kingbreaker, the fantasy trilogy Godspeaker, the bestselling tie-in novels Stargate SG-1: Alliances and Stargate SG-1: Do No Harm and Star Wars The Clone Wars: Wild Space. Writing as K.E. Mills she is the author of the Rogue Agent series. Here is an excerpt from her article "The Tyranny of the First Draft". Read the whole thing here. Writers are schizo people. We need to wear two hats: the Writer, and the Editor. And we have to keep one locked in a box while the other is working, or we won’t finish the book. The Writer writes – and must be free to write even though the work is still far from perfect. In the first draft it doesn’t matter if the prose is clunky sometimes, if there’s some word repetition, if the dialogue is occasionally stilted. None of it matters. It can be fixed on the rewrite. The Writer must not be paralysed by the carping of the Editor, who notices everything that’s wrong with the work and wants it fixed now. It doesn’t need to be fixed now. It’s more important to finish the first draft and fix it later. Of course, when the first draft is finished the Writer has to sit in the box so the Editor can assess the story, iron out the lumpy bits, fix all the plot-holes and so on and so forth without the Writer bleating and complaining about the cuts and changes. But only when the first draft is finished. Turning the Editor loose in the middle of the writing process is usually fatal. The Editor is critical. The Writer is creative. These two essential personas must be kept apart, or there’s a chance that first draft will never be finished. The only way to do this is to do it. There are no magic bullets, no quick fixes, no secret handshakes that can get you over the finishing line. The only way to run a marathon is by putting one foot in front of the other for 26 miles. The only way to produce a finished novel that you can show to an agent or an editor is complete the journey from page 1 to the end. That’s it. It’s that simple … and that hard. There is no point, if you’re a new writer, in showing an agent or editor the first three over-polished chapters and a synopsis. More than anything, these people want to know you can go the distance. Writing a novel is a mammoth task. You have to prove you’ve got the stamina to finish. You also have to prove you’ve got a good style and a good plot and engaging characters … but if you can’t finish the book, none of that matters. Yes, it’s scarey. It’s a lot of time and energy invested with no guarantee of success. No promise that you’ll be recognised, or published. Or, if you do have that contract, that anyone will buy the damned book when it’s in the shops. That’s the nature of the beast. You either accept it, or you take up knitting. You know what they say: feel the fear and do it anyway. Because if you don’t, then it’s game over. Nothing happens without a first draft. So write the damned thing. Get it done. Get it finished. Give yourself permission to write badly. Give yourself permission to write worse than badly. Give yourself permission to stumble, to flail, to thrash around on the pages like a raving loon. Finish your first draft, so you can turn it into your second draft, and your third draft … or as many drafts as you need to make it a fabulous novel. Without a completed first draft that will never happen. The first draft is the first step, it’s not the end of the journey. It’s where the story begins. Do I need to say it again? Keep your eyes facing forward and write, write, write, till you reach The End. And enjoy yourself. It’s supposed to be fun! Today I am seriously considering taking a break from writing to just revel in the fact that I wrote a whole book. Either that, or I'm going to sit down with my manuscript and a red pen and go to town on it. One or the other!